Oliver Stone touches a nerve in his takedown of the corporate media’s support of US Interventions in Latin America and ongoing demonization of Hugo Chavez. Noted US political firebrand and film director Oliver Stone attended the Bolivian premiere of his documentary “South of the Border” Tuesday night at El Coliseo La Coronilla, an enormous indoor sports stadium in Cochabamba. More than six thousand Bolivians, including Bolivian President Evo Morales, attended. Stone even walked away with the key to the city, bestowed on him by the city’s mayor. The event is part of a larger tour Stone has made through Spain and South America, where the film will be released this month. Cinema Libre Studio will un-reel the documentary in the US June 25, and Dogwoof will release it in the UK July 30. Historian Tariq Ali and Mark Weisbrot wrote the film, a chronicle of Stone’s travels throughout South America late last year and his interviews with leaders in the region. Stone is a close friend of Cuban leader Fidel Castro, Venezuela’s Hugo Chavez and Bolivia’s Evo Morales. 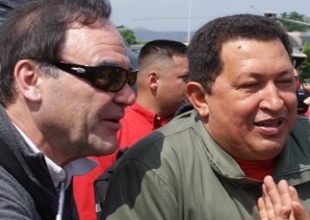 American filmmaker Oliver Stone said Friday he deeply admires Hugo Chavez but suggested the Venezuelan president might consider talking a bit less on television. Promoting his new documentary “South of the Border” in Caracas, Stone heaped praise on Chavez, saying he is leading a movement for “social transformation” in Latin American. The film features informal interviews by Stone with Chavez and six allied leftist presidents, from Bolivia’s Evo Morales to Cuba’s Raul Castro. El gobierno boliviano invitó a los directores estadounidenses de cine James Cameron y Oliver Stone a la próxima Conferencia Mundial sobre Cambio Climático, informaron hoy los organizadores. Esas fuentes confirmaron que el gobierno boliviano hará conocer el 10 de abril la nómina de presidentes de países y delegaciones que confirmaron su participación a la cita, prevista del 20 al 22 próximos en Cochabamba (centro). En el caso de Cameron, hace unos meses el presidente boliviano, Evo Morales, quedó muy impactado por su filme Avatar, el cual elogió por la defensa de la Madre Tierra que muestra. Otros invitados son el lingüista y filósofo estadounidense Noam Chomsky, el teórico de la Teología de la Liberación, el también sacerdote Leonardo Boff, y el ex presidente de la Asamblea de Naciones Unidas Miguel Descoto. La cita pretende aportar iniciativas concretas en defensa del medio ambiente, y espera reunir a unos 20 mil participantes, entre ellos destacadas personalidades de la política, la cultura y la investigación. Stone undertook this project with Chávez after his initial idea to document Mahmoud Ahmadinejad was turned down by the Iranian president. For South of the Border, Stone enlisted the help of British-Pakistani commentator Tariq Ali, who had already worked with Chávez to write the 2006 book Pirates of the Caribbean: Axis of Hope.